Suddenly, Zimbabwe’s biggest newspaper can print anything. It’s harder than it sounds. Sat., Nov. 25, 2017, 9:44 a.m.
HARARE, Zimbabwe – For 37 years, it was the official newspaper of Robert Mugabe. Then, this month, the staff of the Zimbabwe Herald got an impossible assignment: They would have to cover the downfall of their benefactor. In the days after Mugabe was detained by the military, editors and reporters gathered in a wood-paneled newsroom in an old office building downtown, trying to figure out what to do. Should they back Mugabe or the military takeover? Did they still have to echo the party line? What was the party line, anyway? The rapid descent of the world’s oldest head of state came as a shock to many Zimbabweans who assumed that Mugabe would rule the country until his death. The Herald, which is owned by the government, had advanced the idea that his rule was untouchable. Until two weeks ago, the paper was printing laudatory stories and editorials about the country’s despotic leader. “President Mugabe deserves Nobel Peace Prize,” said one headline last month. “He is undisputedly the most exceptional figure in the history of our country,” another article said in September. The paper’s editors and reporters didn’t usually agree with those messages, but working for the Herald meant shelving your own politics. 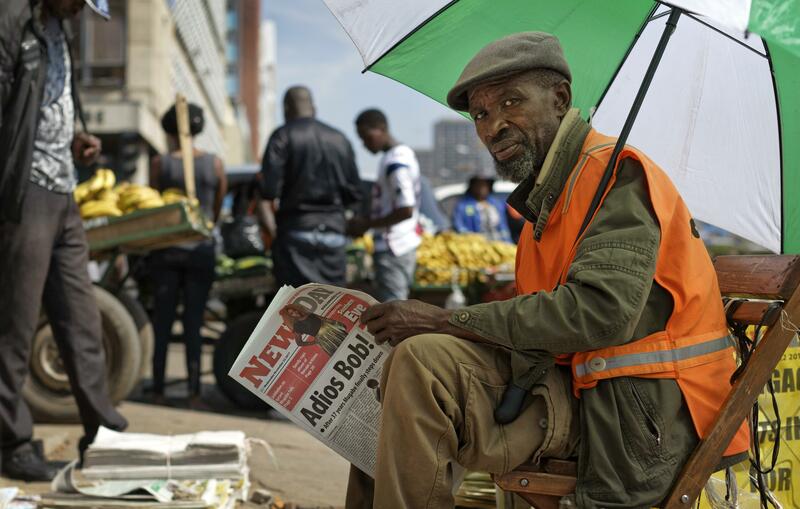 It was the best-paying newspaper in Zimbabwe, and in a country with a soaring unemployment rate, that meant something. Even after Mugabe’s house arrest, the paper decided to play it safe. “Business as usual across the country,” its front-page headline said, ignoring the shock wave rippling across Zimbabwe. But inside the newsroom, a frenzied revolution was taking place. Reporters who had for years bit their tongues while writing flattering stories saw an opening. “It was a seismic shift for us,” Share said. Days later, when thousands poured onto the streets of Harare to demand Mugabe’s resignation, the tenor of the paper’s coverage began to change. It started publishing straightforward news reports about the country’s swelling opposition. It sent reporters and photographers into crowds carrying anti-Mugabe signs. For the first time in decades, it gave Mugabe’s rivals a voice. It wasn’t just the Herald that seemed to be liberalizing. Arbitrary police checkpoints vanished overnight. Foreign journalists, once heavily obstructed, could move freely (including into the Herald’s newsroom). The demonstrations themselves were unimaginable only weeks ago. In the following days, the paper wrote front-page stories about Mugabe’s dismissal as head of the ruling party, ZANU-PF. It covered plans by the parliament to impeach the president. It ran op-eds in support of efforts to bring Mugabe down. “We have no doubt that the biggest winner in this fiasco are the people of Zimbabwe,” said one. “This in the Herald. Pinch yourself – it is not April Fools Day,” tweeted David Coltart, a former senator and member of the opposition, after the paper covered Mugabe’s dismissal from the party. It wasn’t just that the Herald was eager to seize a rare moment of press freedom. Its senior editors were also trying to sort out who was likely to emerge from the country’s political chaos – so they knew which horse to back. “You don’t want to step on the wrong toes,” said Phyllis Kochere, the deputy news editor. On Tuesday, the paper sent its parliamentary reporter, Farirai Machivenyika, to cover a session in which lawmakers were expected to begin protracted impeachment proceedings. But about an hour into the session, Machivenyika watched as the speaker of the house stood up with a piece of paper in his hand, a smile spreading across his face. The speaker began to read a resignation letter written by Mugabe. Machivenyika took frantic notes. Like many of the Herald’s reporters, he was born after Mugabe assumed power in 1980. He could hardly believe he was about to file a story about the president’s resignation. In the morning, the newspaper’s staff gathered for the news meeting, its first of the post-Mugabe era. “There’s a need for a coalition government,” said Ruth Butaumocho, the gender editor. “If ZANU-PF thinks it will lead the country alone, they will continue just like Mugabe,” said one editor. “We need to come up with an objective analysis of the trajectory the country’s politics is going to take,” another said. “Things are changing every hour,” Kochere said. “We need more stories!” yelled Nyathi. That day, the major story line was the return of the soon-to-be president, Emmerson Mnangagwa, who had been in exile for several weeks since being fired as vice president. No one – not even the paper’s reporters – was sure how the Herald would cover it. Would Mnangagwa get the same kind of flattering coverage that Mugabe had received for so many years? Would the Herald continue its streak of more objective reporting? That night, Mnangagwa’s speech veered into the anti-opposition rhetoric that Mugabe had often used. Had the paper’s brief window of freedom closed? Back in the newsroom, opinions were divided. “Like any other media business, we are expected to toe the owner’s line,” said Kochere. “There are no sacred cows now,” he said. In the front entrance of the Herald, the portrait of Mugabe had already been taken down, leaving a slightly discolored rectangle on the wall where it once hung. The newsroom looked like any other – with piles of yellowing paper atop desks, clusters of reporters discussing their stories, editors trying to plan the day’s coverage. Kochere looked through a list of story pitches in the center of the room. Outside, a crowd was waiting for Mnangagwa to arrive at the president’s office, waiting to see what he would say on the eve of his inauguration. Published: Nov. 25, 2017, 9:44 a.m.